Oh… my… gosh! 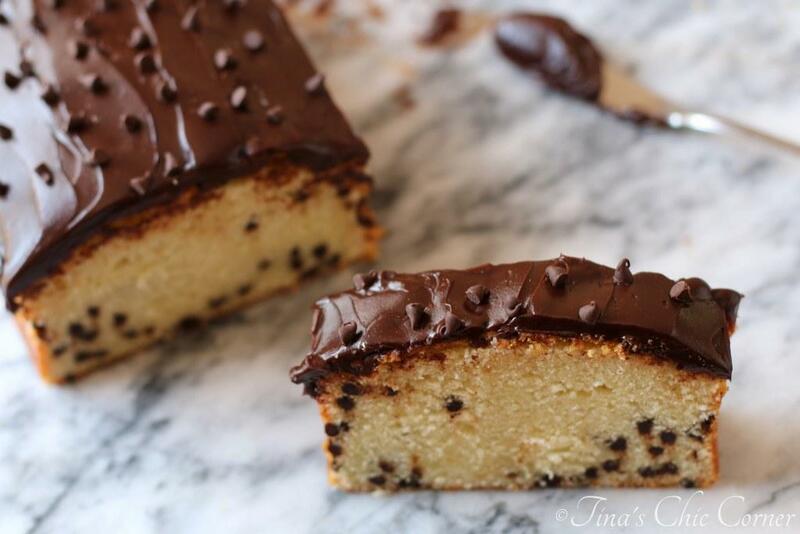 Pound cake plus chocolate plus more chocolate! Does it get any better than this, folks? This idea is not a new revelation, but it’s one that is sure worth having over and over again. Bake it for a BBQ, or when the new school year starts, or for winter holiday gathering, or simply because you feel like having some good eats around the house. 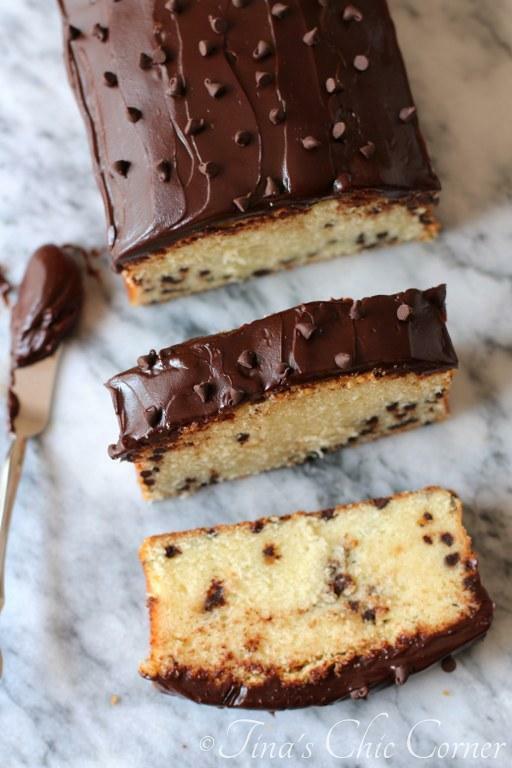 You can’t go wrong with this decadent chocolate chip pound cake at any time of the year. In a saucepan, over Medium heat, bring the heavy cream to a boil. 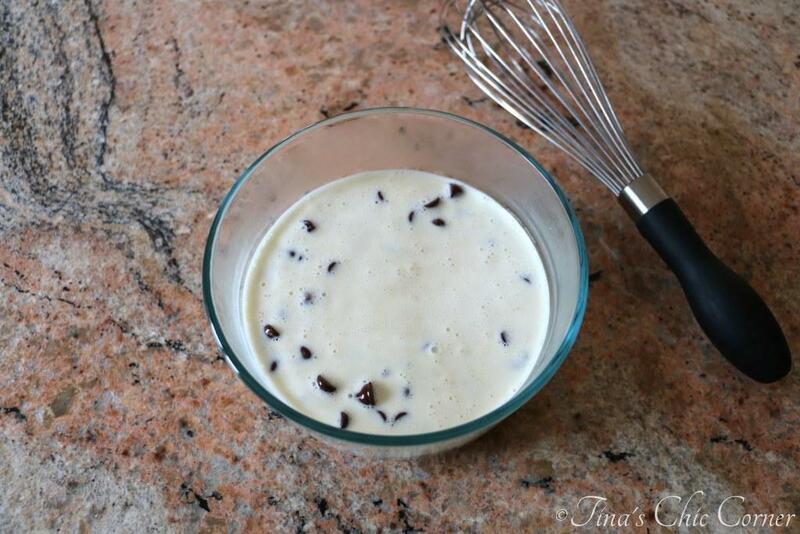 Pour the boiled heavy cream over the chocolate chips and salt and let it sit for 10 minutes. Once the 10 minutes have passed, stir the mixture with a whisk until it’s smooth and shiny. 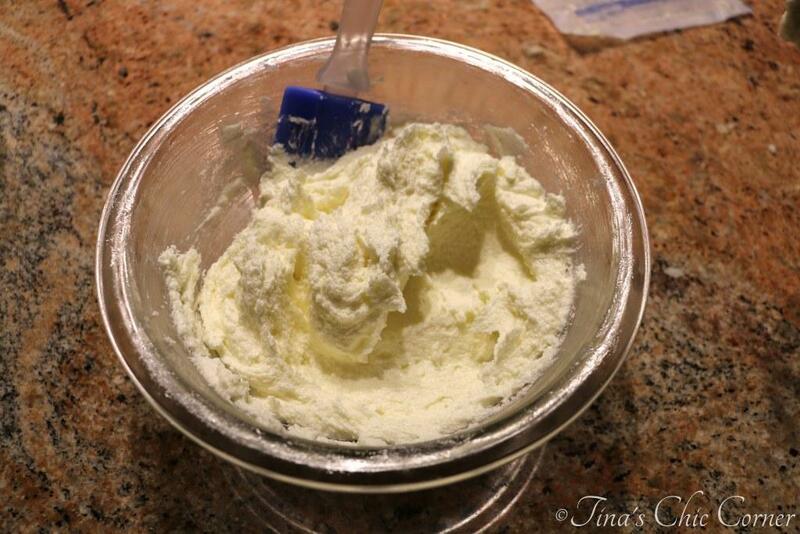 Finally whisk it some more to whip it up a little prior to spreading on top of the pound cake. In a medium bowl, whisk together the flour and baking powder. Set the dry ingredients aside. Mix in half of the dry ingredients. Mix in the remaining half of the dry ingredients. Gently fold in the miniature chocolate chips. Pour the batter into the greased loaf pan and bake it for 55 to 60 minutes, or until a tester inserted in the center comes out clean. Once the cake has cooled completely, remove it from the pan. 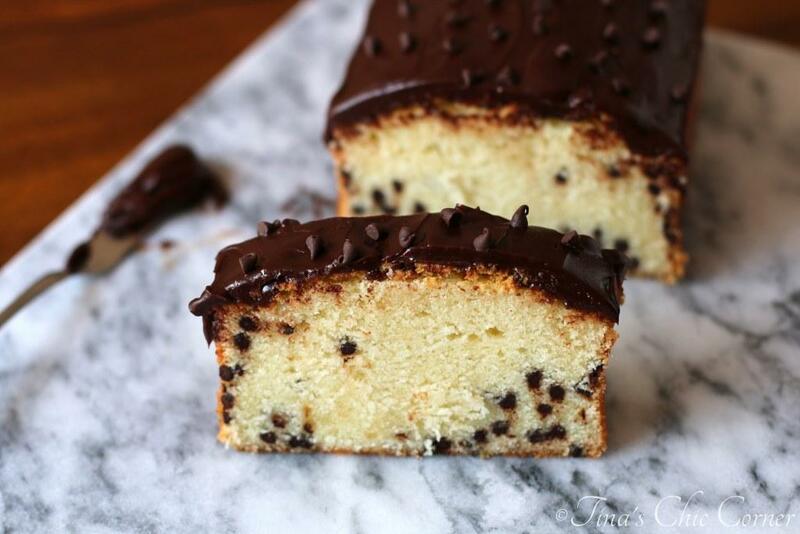 Spread the ganache on top of it and sprinkle with a few miniature chocolate chips. Have you ever made ganache before? It’s surprisingly easy to make. Also, it’s super versatile and you can use it on a variety of other baked goodies. I’m imagining it on high class cupcakes as an example. Let’s talk about this pound cake. It’s really the best recipe out there. Does it look familiar? I simply took my Pound Cake recipe and halved it so now it fits conveniently into a loaf pan. Head on over to that post if you’re interested in some nifty baking techniques when it comes to making an awesome pound cake. For example, the creaming step is pretty important. Get the butter and sugar party looking light and fluffy. Seriously guys, I don’t know how to convince you how great this is (but I’ll try 😉 ). The pound cake is a dense buttery loaf. When I say “dense” it’s not too heavy, but just the right texture for an awesome pound cake. Have you ever tried a light recipe for a pound cake? I don’t think I can even go there. If you want pound cake then you have to go all the way and use all of the butter and sugar. After all, it’s called pound cake for a reason. 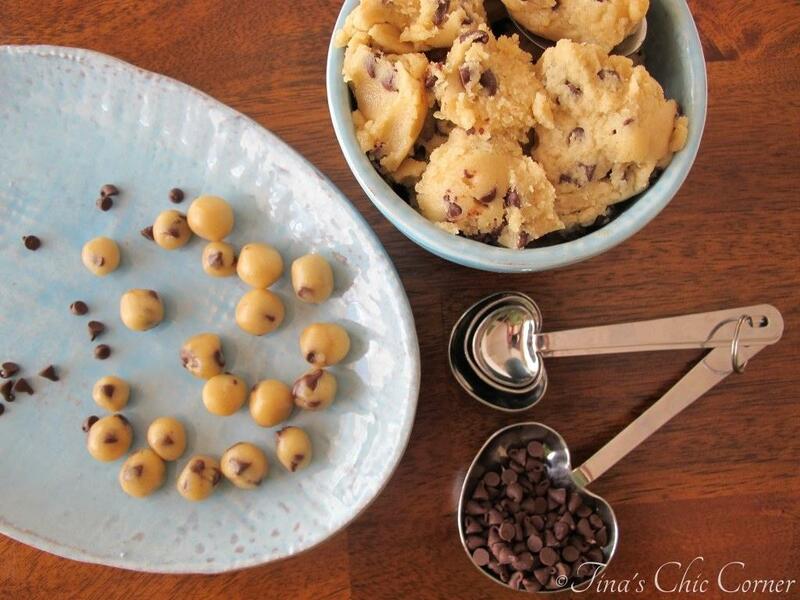 How adorable are these miniature chocolate chips?! You can certainly use the regular sized ones instead. My husband’s step mother always used the full sized ones. I only used a half a cup in the pound cake because I knew I’d be adding the sweet ganache on top. Can we talk about how stunning this looks? Yup, not only is it out of this world tasty, but its presentation will surely impress everyone. What’s one of your favorite classic recipes that can be eaten 365 days a year? Oooo you have me wanting dessert and I haven’t even had dinner!! haha I love a good pound cake and with chocolate chips? The ganache is so pretty for the topping…. and the extra chocolate is always a good thing! 🙂 Happy weekend! This is making my mouth water. 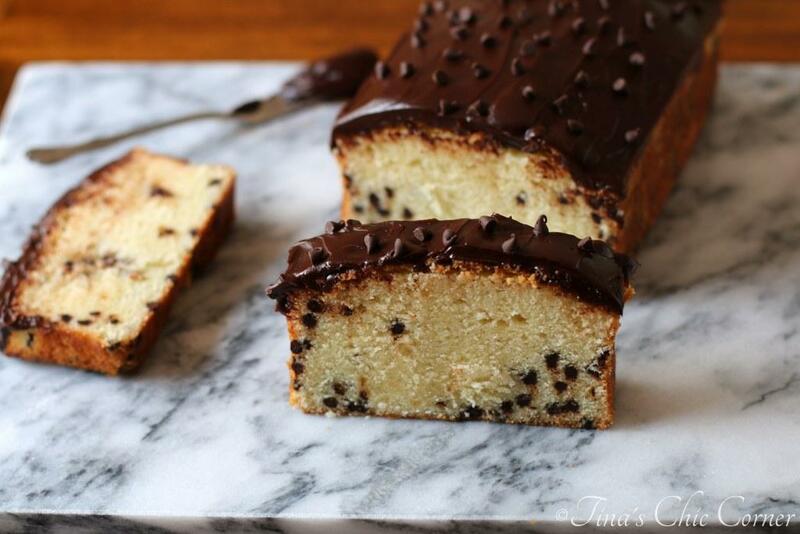 I never thought of putting ganache over pound cake and with chocolate chips to boot. Yum! Ooooh my gosh, Tina. This cake sounds so incredibly good, and your pictures are mouth-watering! This cake would definitely be a ‘just because’ kind of treat…too good to wait to make until a special occasion! nice variation of pound cake! i love the ganache. I bet this really is beautiful, Tina. I don’t really like butter-based frostings, so this ganache sounds like my idea of a heavenly frosting. 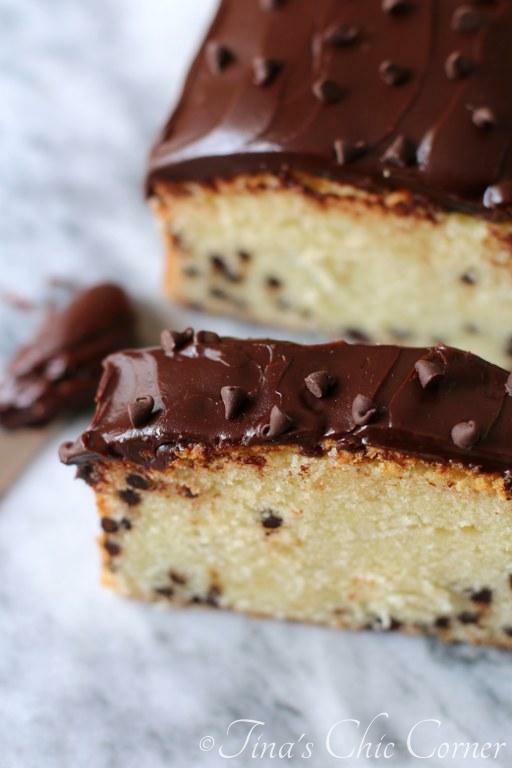 I love the fact that this cake is simple and light and yet … it has lots of chocolate in it! Oh yes, this ganache is a great alternative to tradtional butter frosting recipes! 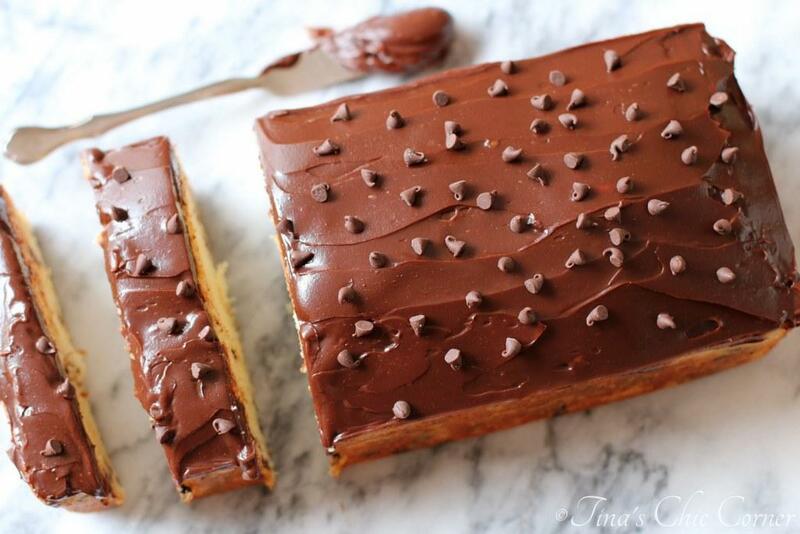 I was drooling over this when I saw it on Google+ — it looks gorgeous, especially with that luscious frosting and more chocolate chips on top! Thanks Kelly! I wish I had some to munch on too! This is a real beauty, Tina. I adore butter-based frosting/icing, but a ganache… argh… drooling, tis my my idea of a wicked chocolately treat. Im not entirely sure what a pound cake is, it looks like a sponge, maybe a little more dense, is it called pound cake because thats what it does to ones weight? Adds a pound. LOL! I hope you are having a lovely week, Anna! It’s almost the weekend! That looks amazing Tina! You make some mean looking desserts. Pinning because it looks so dang good. You can’t do a light pound cake. Go big or go home! This is so great. I love dipping pound cake into chocolate fondue. This is much neater. And so tempting me right now! Your pound cake looks lovely! I am making this pound cake as we speak and am dreadfully concerned. The tester is still not coming clean, the top is practically burnt and it has been in for about an hour and 15 minutes! I have a temperature gauge in the oven so I know it is accurately temped. Haa anyone else experienced this? I made this last night and had the same problem, middle never really got done until after 1 hour and 20 mins. Outside was burnt. I made it in a non stick loaf pan. Could that make a difference? Put in middle of oven. I use an aluminum bundt pan, but I don’t think it matters. And like you, I bake it in the middle of the oven. Since I’ve made this pound cake several times without any issue, the only thing that I can think of is that everyone’s ovens are different and that may cause a discrepancy in the cooking time and oven temperature. I don’t know if this works, but I thought I’d pass along what I found. I hope it helps you if you decide to try to make it again. Good luck, Jeanette! I’d love to hear back from you because I like to learn from my readers. I made this for Sunday dessert tonight~ the overall flavor was fantastic, but the cake was a bit dry… the ganache however, was to die for! I’m so glad you tried it and I appreciate you letting me know. 🙂 I have 2 theories on the dry bit… I measure my flour by using a tablespoon to scoop the flour into the cup. Once it’s heaped over the top I level it off with a butter knife. If you dove right into your flour container with your measuring cup then you likely ended up with too much flour because the act of scooping that way forces more flour into the cup. By the way, if this sounds like what might have happened please let me know. I’m going to start listing the flour in both cups and ounces in an attempt to be more clear. As I understand it, all true French recipes use weight for flour because of this exact problem. The other possibility is that it was baked too long. I often doubt myself when I’m trying to determine if something is ready to be pulled out of the oven. In fact, I’m so bad about this I almost always call my husband in to the kitchen for a second opinion. Marrgaret, I enjoyed reading your lovely note. 🙂 I hope you enjoy this cake, as it’s a favorite in our home. Let me know how you make out. Thanks so much for stopping by and taking the time to write me. Happy holidays!! I attempted to make this but at 1 hour in the tester came out completely gooey and the top was browned but still jiggled. I know I ended up putting it in for too long after that so it came out dry, but even though it seemed like it was not done at one hour should I have taken it out then and let it cool? I only had a glass pan, could that have been the problem? Am willing to try this recipe again but want to figure out what went wrong! Blah, I wish it didn’t go wrong for you! I’ve made this many times and have not had this issue. My only theory at the moment is that everyone’s oven is different which will may impact the cooking time. The tester should come out clean or nearly clean when the pound cake is done cooking. I use an aluminum pan, but I don’t think it makes much of a difference. I don’t know if this works, but I thought I’d pass along what I found. If you try to make this again using this tip, let me know how you make out. Hi Tina! I made this tonight and it turned out so beautiful! I also made a second batch, but substituted pumpkin in or the eggs, added a little pumpkin pie spice and it so good. Thank you for the recipe! I really appreciate you stopping by and for taking the time to write me! I wish you a very happy holiday season!! My amazing son will be 13 on Sunday and he requested chocolate chip cake, woo-hoo! Is this cake too heavy to use it in a layer cake? Would the top layer smoosh down the bottom layer? I presume I’d have to double the recipe to accommodate the volume needed for 2 round cake pans. But I guess if I filled those pans half full and had batter left over, I could scrounge up a small loaf pan to make a personal (the baker’s!) cake as well. What are your thoughts on coating the mini chips with a light spritz of cooking spray and fluffing them in flour to prevent sinking? Hi Samantha. I’ve never seen a pound cake recipe used as a layer cake. That doesn’t mean it wouldn’t work, but I have the same hunch as you that it might be too heavy and smoosh down the bottom layer. 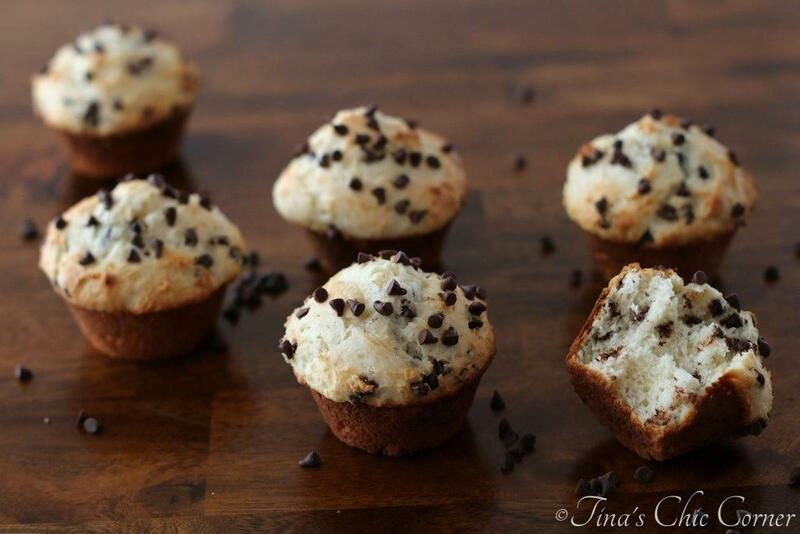 Sometimes I coat the chocolate chips with a dusting of flour but it doesn’t always keep the chips from sinking. I don’t know why it works sometimes and not others, but since it’s not consistent I don’t always include that tip in a recipe. It can’t hurt to do that though because you are no worse off than if you hadn’t done it. 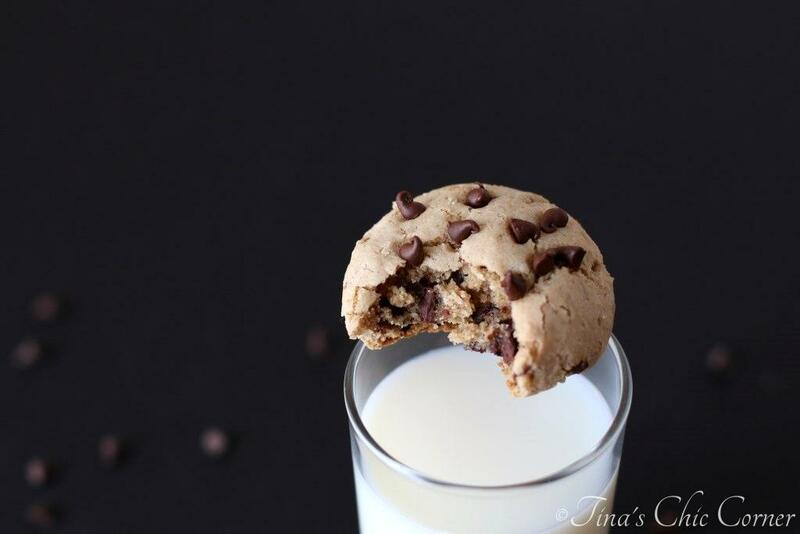 This recipe is dangerously good! I make it frequently. I’m so glad you love this recipe! !